Zlín Region (Czech: Zlínský kraj) is an administrative unit (Czech: kraj) of the Czech Republic, located in the central-eastern part of the historical region of Moravia. It is named after its capital Zlín. 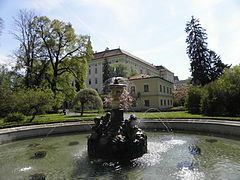 Together with the Olomouc Region it forms a cohesion area of Central Moravia. It is located in the eastern part of the Czech Republic, where the borders with Slovakia (Trenčín and Žilina Regions) are formed by its eastern edge. It borders with South Moravian Region in the southwest, Olomouc Region in the northwest and Moravian-Silesian Region in the north. Culturally, the region is composed of parts of three traditional Moravian regions: Hanakia, the Moravian Slovakia and the Moravian Wallachia, as the city of Zlín lies roughly at their tripoint. 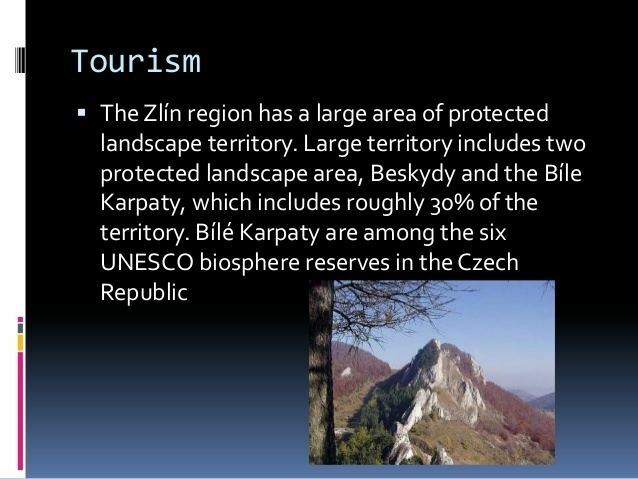 The Zlín Region was established on 1 January 2000 on the basis of the constitutional act No. 347 from 3 December 1997 on foundation of higher self-governing units. 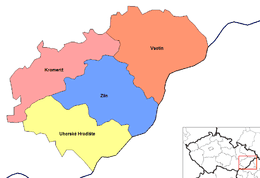 It was formed by a merger of parts of Jihomoravský Region (the Zlín District, the Kroměříž District and the Uherské Hradiště District), and the Severomoravský Region (the Vsetín District. From 2003 on, the region has in total 305 municipalities of which 30 are towns. There are 13 municipalities with extended powers and 25 territorial districts of municipalities with authorized municipal office. According to government statistics, the Zlín Region is the safest region in the Czech Republic; it has the lowest number of assaults, rapes, suicides and road accidents in the country. Geologically the Zlin Region is within the Vizovice Highlands. With its area of 3,963 km2, Zlín Region is the fourth smallest region of the Czech Republic. The character of the Region’s territory is very diverse. While parts of the region are hilly, flat fertile areas of Haná and Slovácko stretch in the Kroměříž District and the Uherské Hradiště District. The Moravian-Silesian Beskids (in Czech: Moravskoslezské Beskydy) with its highest peak Čertův mlýn mountain (1,206 m) is situated in the northern part of the region and the Maple Mountains mountain range (in Czech: Javorníky) with its highest peak of Velký Javorník (1,071 m) is located in the east. Towards the south, forming the border with Slovakia, there is the White Carpathians mountain range (in Czech: Bílé Karpaty) with its highest mountain of Velká Javořina (970 m). The highlands of Hostýn-Vsetín Highlands (in Czech: Hostýnsko–Vsetínská hornatina) and Vizovice Highlands (in Czech: Vizovická vrchovina) pass south of the Moravian-Silesian Beskids mountain range. On the south-western part of the Region, there are Chřiby highlands with the highest point Brdo (587 m). 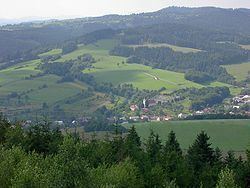 The Upper Moravian vale (in Czech: Hornomoravský úval) passes through from the west among the highlands of Chřiby highlands and above mentioned hilly countries through the Kroměříž District up to the Zlín District. The Lower Moravia vale (in Czech: Dolnomoravský úval) passes through along the Morava River in the Uherské Hradiště District to South Moravian Region. Most of the streams in the area flow to Morava River. The most important ones are the Bečva River in the northern part and the Olšava River in the southern part. Morava River is the biggest river of the Region flowing through both the vales from west to the south. The region’s climate is rather favourable. The average temperature of air was 9.8 °C in 2012 and the total amount of precipitation was 598.6 mm/m2. Most of the soils in the region are poor in minerals (with the exception of potassium and magnesium) and humus. These are the brown earth of the highlands and the podzolic soils that locally pass to brown earth of the lower locations towards the south. In the vales, there are very fertile brown earth and chernozem. High-quality floodplain soils surround the Morava River. It is rather difficult to cultivate soil in a large part of the Region due to the steep land and variety of the terrain. Regional representatives voted in 2001 on a proposed name change to the region. The alternative Východomoravský kraj (East Moravian Region) was proposed, however a majority of voters elected to retain the region's existing name. There were 587,693 inhabitants living in the region at the end of the year 2012. While women formed 51.1% of the total population, men accounted for 48.9%. Average age was 41,7 years in 2012. Children until 14 years of age made up 14.3% of all inhabitants and people of 65 or more 17.3%. The density of population of 148 inhabitants per km2 exceeds the national average. The highest density of population occurs in the Zlín District (186 inhabitants per km2) and the lowest in the Vsetín District (127 inhabitants per km2). Besides of the above-mentioned municipalities, following towns had a population exceeding 5,000 (as of December 31, 2013): Napajedla (7,308 inhabitants), Hulín (7.068 inhabitants), Staré Město (6.807 inhabitants), Slavičín (6.645 inhabitants), Brumov-Bylnice (5.675 inhabitants), Zubří (5.599 inhabitants), Kunovice (5.529 inhabitants), Luhačovice (5.112 inhabitants), Valašské Klobouky (5.039 inhabitants) and Chropyně (5.029 inhabitants). Economy in the Region was and still is based primarily on capitalisation of input raw materials and semifinished products. In 2012, the total GDP reached 7,538 million EUR. The region’s GDP per capita was EUR 12,813 (88% of the national average), ranking seventh among the regions of the Czech Republic. Industrial potential of the Region lies in manufacturing enterprises that represent 16% of total registered entities. They are mainly comprised by metalworking and wood-processing industries. However, they suffer from low level of modernisation of production compared to the rest of the Czech Republic. As of end 2012, the Zlín Region had 138,269 legal and physical entities out of which 14,379 had employees. 1,382 enterprises had 25 or more employees. The registered unemployment rate was 10.4%. Within the Region, the highest unemployment rate was reported from the Vsetín District (almost 15%), while the lowest from the Zlín District (8.8%). A total of 17 km (11 mi) of motorway is present in the region. The length of operated railway lines in the region is 359 km (223 mi). There are two universities in the region: Tomas Bata University in Zlín and European polytechnical institute in Kunovice. The former has a public status, 6 faculties and can confer a bachelor's and master's degrees. The latter one is a private college .The network of pre-school and school establishments consists of 310 nursery schools, 257 basic schools, 17 grammar schools, 71 secondary schools, 11 higher professional schools. On average, a general practitioner takes care of 258 inhabitants in average. Acute, successive and rehabilitation health care is ensured by a network of 10 hospitals with 2,849 available beds. Zlín Region is attractive for tourists featuring a number of nature, cultural and historic monuments such mountains, garden architecture, spas, wine valleys, remains of the Great Moravia empire, series of religious monuments and historically valuable buildings as well as a unique example of modern Baťa’s functional architecture. 48.9% of soil in the region is agricultural soil and 51.1% is non-agricultural. Most agricultural soil belongs to the Uherské Hradiště District (57 277 Hectares, of which 70.1% is arable land). There is a completely different division of soil in the Vsetín District where the percentage of non-agricultural soil is much higher (64.6%) and 83.8% of it is covered with forests, mostly spruce forests. Spa Luhačovice – Tens of thousands of visitors arrive every year to the biggest Moravian spa in order to relax and gain health. The spa has a long tradition of spa treatments of the respiratory system, digestive system, diabetes and locomotive organs. Very famous are the curative springs, favourable climatic conditions and also the typical architecture. Down-hill and cross country skiing is possible in Pustevny, Portáš, Velké Karlovice, the Chřiby highlands and Hostýn-Vsetín Highlands. Along the Morava River there is the Moravian cycle route, which is connected to the Austrian and Slovak cycle routes. Mountain climbers can practice in The Pulčín rocks, Lačnov rocks or Čertovy rocks. An original experience is the voyage on the Baťa canal (in Czech: Baťův kanál). Water reservoirs Horní Bečva, Bystříčka, Ostrožovská Nová Ves, Rusava, Pozlovice and Smraďavka. A worldwide appreciation is given to the Podzámecká and Květná gardens and archiepiscopal castle in Kroměříž, which are entered in the UNESCO List of World Cultural Heritage. The Museum of footwear in Zlín. The events that document the ethnographic richness of the region are the Carnival in Strání, Ride of kings in Vlčnov or the Kopaničářský festival in Starý Hrozenkov. Every year the Summer film school takes place in Uherské Hradiště and the International film festival for children and the young in Zlín.